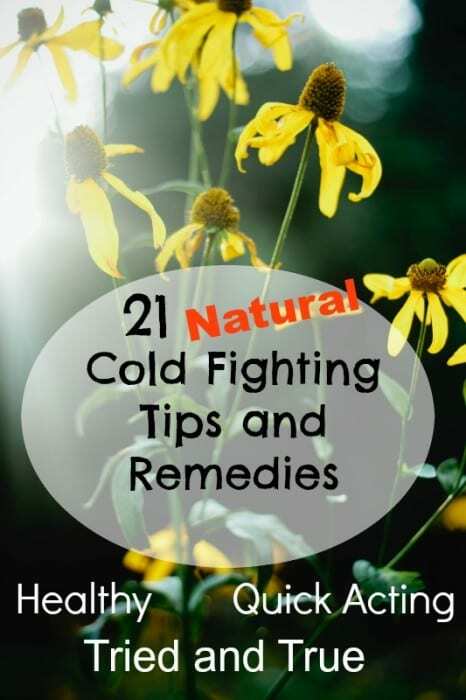 Want to know the best tried and true natural methods for kicking a cold or the flu? People all over the world have various natural methods that make them feel better fast. I know that my readers are intelligent and a gold mine for fabulous ideas and information. 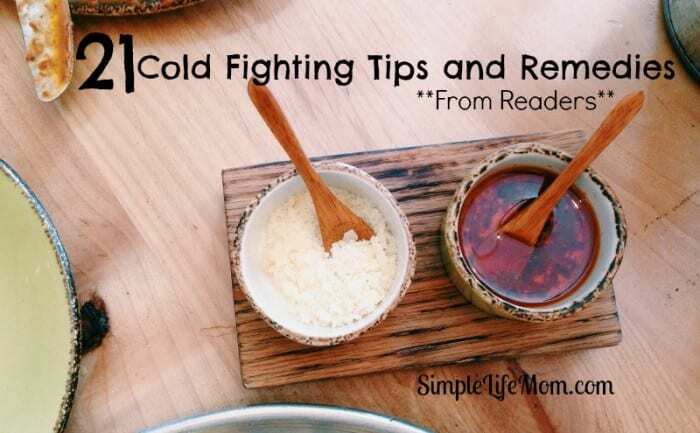 Here are over 20 cold fighting tips and remedies from you, the readers, from a recent Facebook conversation. Water, tons of water, Hydrate, Hydrate, Hydrate! We know this, but do we always do it? I’m good at getting my kids to drink, but don’t drink enough when I’m sick myself. Flush out your system, get the ickies out! As well as staying hydrated, it is also important to stay warm in the home, so it should be your priority to make sure your heating is working correctly. If it is not, I’m pretty sure you will notice the change of temperature in the home. Plus, if you have a cold, this just makes it worse. If this is something you or anyone you know is going through, it may be best to look into a site like https://allenkelly.com/, so you can find a specialist company who will be able to resolve this issue and get your home feeling a lot more comfortable to live in. Your health should always be your top priority. The most popular “go to” remedy was some type of tea or hot liquid. Hot Water with Lemon – lemon is slightly acidic and has Vitamin C. This makes it soothing to the throat, while also giving you that bump in Vitamin C that is supposed to help your immune system as it fights the sickness. Raw Honey – Adding Raw Honey to your hot lemon water will soothe your throat, but also helps relieve coughs. Plus, using honey as a natural sweetener and getting extra nutrients from the raw honey at the same time is always a plus. One reader suggested leaving honey water simmering on the stove where she could take a little throughout the day. Ginger – if you’re making that honey, lemon water, why not add some fresh ginger as well. Ginger coats the intestines, relieves inflammation, and helps relieve nausea. Grate some fresh ginger into a pot of hot water and let it steep for 10 minutes before using. Russian tea – Russian tea is not really a tea, but is a combination of orange, apple, lemon, pineapple juices, cinnamon, and cloves. The juices will give you a great vitamin boost, while the cinnamon and cloves are known bacteria killers. This is a powerful punch to have simmering throughout the day. Add 1 cup of orange, apple, and pineapple juice to a pot. Add 2 Tbsp lemon, 3 cloves, and 1/2 to 1 tsp cinnamon. Yum! Extra Garlic in Food – When you’re cooking, add that garlic. Raw Garlic – My sister-in-law eats raw garlic daily. They swear it’s the best thing for killing a sickness before it takes hold. One reader suggested smearing it on toast. My son does that; stinks up the house, but I don’t complain. It keeps him healthy! Essential oils are powerful. They should not be used just because you read it somewhere – like here 😉 They are so powerful that you really should do a lot of reading before jumping in and slathering them all over you. That being said, they are my first “go to” when we are coming down with something (that and elderberry), because of their strength and effectiveness. Oregano Oil – Oregano essential oil should always be diluted! It is extremely powerful. Oregano is a great antibacterial. Along with cloves, I consider it the best. Yet, it should not be used if you are anemic or pregnant. Dilute: 1-3 drops in 8-16 oz of orange juice. Thieves from Young Living – your major essential oil companies will have their own E.O. combination ready made for you to buy and use to fight colds. This blend has clove, lemon, cinnamon, eucalyptus, and rosemary. On Guard from Doterra -You can easily make this blend as well using Wild Orange, Clove Bud, Cinnamon, Eucalyptus, and Rosemary essential oils. To be honest, eucalyptus studies have not found it to be a very powerful oil against colds, but it has been used traditionally as an uplifting oil. Fire Cider – I have yet to make fire cider, but I’ve heard a number of people say it is a traditional method that is highly effective. Here’s the recipe I’m going to try: Craft Your Own Fire Cider. Elderberry Syrup – Learn how to make your own Elderberry Syrup. Definitely one of my favorite cold and flu remedies. It’s easy to make and very effective. Ginger Shots – My method is to grate 1 inch of ginger into a 1 cup hot water. Add lemon, cinnamon, and honey to taste. Vitamin C – Kombucha is a great and easy source of vitamin C, so it orange juice. Vitamin D – Debate has arisen around vitamin D. It seems that those with low Vit. D are more likely to get colds in the first place, but dosing yourself after you’ve gotten a cold may not help you fight the cold off quicker. Like I said, it’s still being debated, but what’s clear is that it is vital to our health. Get that sun as much as you can (just don’t get burned). Zinc – high levels of zinc are found naturally in pumpkin seeds, dark chocolate, and garlic (to name a few). There are also many ready made combinations of zinc and vitmin c.
Echinacea – get echinacea from teas, or grow your own (the cone flower). Apple Cider Vinegar – many people swear that a 1-2 Tablespoons of acv just when you are getting sick will kill the germs before they can spread. You can add it to a drink, or hold your nose and down it. Other ideas that were mentioned were over the counter drugs, a shot of tequila, a lemon and tapatio (haven’t tried that one), plus the all important….Chicken soup, Blankie, tv, remote, bed, and a friend to share it with! You all are great! It’s been so much fun getting to know you all a little bit better over the months. I’m sure we didn’t hit them all. Please share your “go to” home remedy in the comments below. Linked to some of these great blogs. This post contains affiliate links. Yes! I am a big proponent of tea! Also just loading my system up with at least 100oz of water a day! I agree, just for overall health water makes a huge difference. Great post, but there was no mention of peppermint tea, or oil. Shared and pinned followed you from the Let’s Get Real Facebook group. That’s what the comment section is for Joyce. Thanks! I am all about oils, but need to learn more about herbs and such. Great post! Great suggestions!! Many of our favorites are on your list. We use the lemon tea all the time, in fact my kids always called it a hot lemonade. Another great aid is mixing cinnamon and honey into a sort of paste and eating it like a ‘sucker’ on a spoon. For those who like honey and cinnamon, it is a treat and a natural immune booster. It will stop that virus in its tracks. My oldest daughter who has to be very careful because of her meds loves this concoction. Elderberry is also a favorite standby for us. I have never tried the ginger, but I am hearing so much about it that it is definitely worth looking in to deeper. Wow! It’s unbelievable how many natural remedies exist! Different people respond to different things – not only because there are different germs, but because our bodies respond to herbs and such differently as well. It’s great to have a variety at your finger tips. Don’t forget kombucha(not from the store I’ve never tried those). My scoby is an amazing help during cold & flu season! That’s right!! Love that kombucha!